MWF alumni and their Mentees at the Namibia Connect Camp for the Young African Leaders Initiative, showing hands in the shape of Namibia. 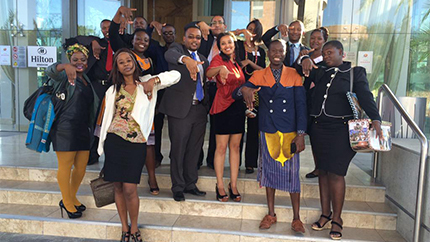 From March 9 through May 15, 2015, The Collaboratory co-hosted the first four of eight Young African Leadership Initiative (YALI) Connect Camps in Tanzania and Namibia, partnering with Ohio University. The Connect Camps are regional, week-long workshops for Mandela Washington Fellowship (MWF) alumni and their mentees to share expertise, learn about human-centered design, test entrepreneurial approaches, and work with low-bandwidth technology for collaboration. The Camps encouraged participants from Southern and Eastern Africa to use their new resources to strengthen local communities. From the workshops, MWF alumni and mentees initiated venture model pitches for social change projects in which they were interested. Projects ranged from an off-line digital library project for vulnerable youth, to a partnership with Open Street Maps (OSM) experts at the Tanzanian incubator “Buni Hub” exploring community mapping for local community development and eco-tourism, to increasing internally-displaced South Sudanese women living in conflict zones voice in the peace process. Four more week-long camps will be hosted in Rwanda and Cote d’Ivoire in the coming year.